Help diagnose my shaping/crumb issue? 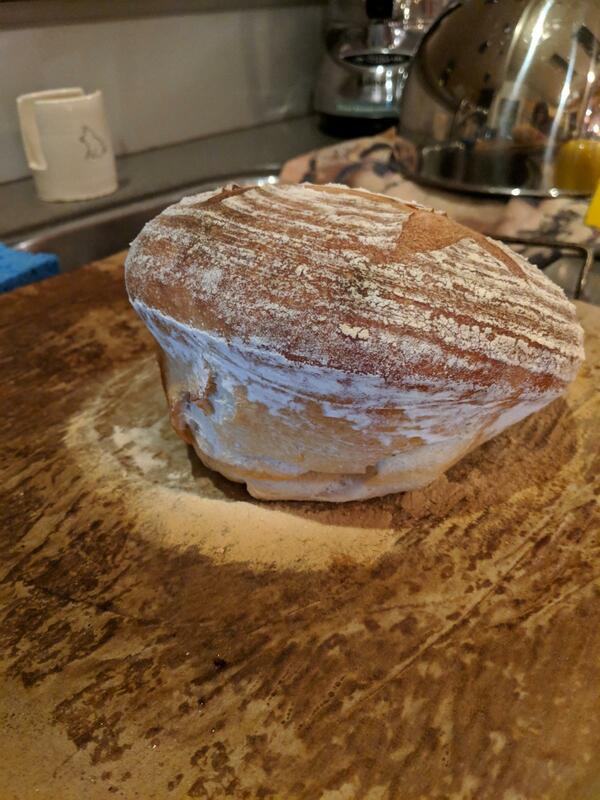 I've just begun my foray into sourdough and I'm using Peter Reinhardt's method from the Bread Baker's Apprentice (newer edition) . My starter seems healthy and I've had it for a month or two now. The issue I'm having is that the loaves seem to explode a bit in the oven and also the crumb is not very open. Not sure if I just need to bump up the hydration for that. .I've attached pictures of the most recent one. After primary fermentation i shaped into a boule and tried to keep good surface tension, then proofed seam side up in my banneton. Did a poke test after a couple hours and when the indent sprang back slowly but stayed, I determined it was baking time. It flipped out nicely. In the oven, however, it seemed to have exploded into this weird muffin shape! Previous loaves I baked before I had a banneton also did this to some extent. Was the loaf underproofed? Is my shaping leaving weak spots that allow this explosion from the seam? Any guidance is appreciated! Almost certainly under bulk fermented. There's a long thread below from another post where Trevor Wilson discusses under-fermenting (and more) in detail. He says that underfermenting is very often caused by an insufficiently active starter. Make sure your starter is very active when you use it to build levain, and that the levain is sufficiently active when you use it in your dough. If you're a newer baker, underfermenting is a very common early mistake, because many are fermenting in temperatures colder than the recipes are based on. Edit: very large holes with closed crumb elsewhere is a classic sign of underfermentation. Thank you both for the input! I will read through the helpful link too. I knew I should have checked the dough temperature since the poke test seems so subjective...Will try again this weekend after I read through that link some more. Thanks again! when i was starting out it was less the temperature and more a case of patience....i never gave enough time to bulk....as far as temperature goes I live in Ireland so its always a little cold and damp. The microwave makes a great proofer. Youll also get used to your starter. Keep a notebook. Yes, I'm sure it is a matter of patience for me too! I am going to rework my starter feeding schedule a bit to see if that helps too. Good idea to keep a notebook for it. Thanks!